A practical guide on how to reduce negativity and embrace happiness. ‘ERASE Negativity’ is not your usual self-help book. Many self-help books prime you for positivity from the outset, filling you with ideas on how to be positive, but as anyone knows, being positive is not always that easy. When someone is depressed and really struggling through some life difficulty, it is difficult to believe the hype of some self-help books. For me personally ‘ERASE Negativity’ bridges that gap where other self-help books are left lagging behind. As someone who has had depression in my life and has had severe anxiety, I want to know that people like me have been able to overcome great difficulty. If someone with an extremely abundant and happy life is preaching at me to be positive when I may be racked with grief, or in a painful addictive cycle, preaching is not going to cut it. What these authors bring together is a book with heart. Separated into 11 great chapters, the book takes you through real life experiences of often heart-wrenching difficulty and how real people come through the darkness and back into the light. While I found that some of the exercises are those I have gone through before myself, the exercises are very valid for someone that really does not know how to change how they think or how to respond to life differently. Chapters involving those who have been in deep drug addiction, to people who have been shown how to have a more positive outlook on life, to those fellow self-saboteurs (like me) who have talents that they are hiding, this book is an inspiration. I was so inspired by one of the stories that it jump-started me to pursue some writing I had been considering for a while. So thank you Sally and Jacqueline. Each chapter takes you through someone else’s life journey, what difficulties they experienced and the changes that took place. And each chapter ends with exercises that can begin the process towards a healthier and more positive outlook on life. Embracing the magic encourages you to find that deep source of magic within that we all have access to, only some of us may have forgotten it along the way. A really lovely reminder and a great encouragement for anyone struggling on their own personal life journey. Anyone struggling with depression, anxiety, or finding life a challenge. Anyone looking for inspiration to pursue their own life passions, and who may feel a little stuck along the way. Anyone who wants to support another by purchasing it as a gift for someone that needs a little emotional support and likes to read. Really easy to read chapters, incredibly inspiring stories, this book walks its talk by showing real life people overcoming great difficulty, and people who have been shown a different way. providing me with a copy to review. You also get extra entries for referrals and carrying out additional steps. 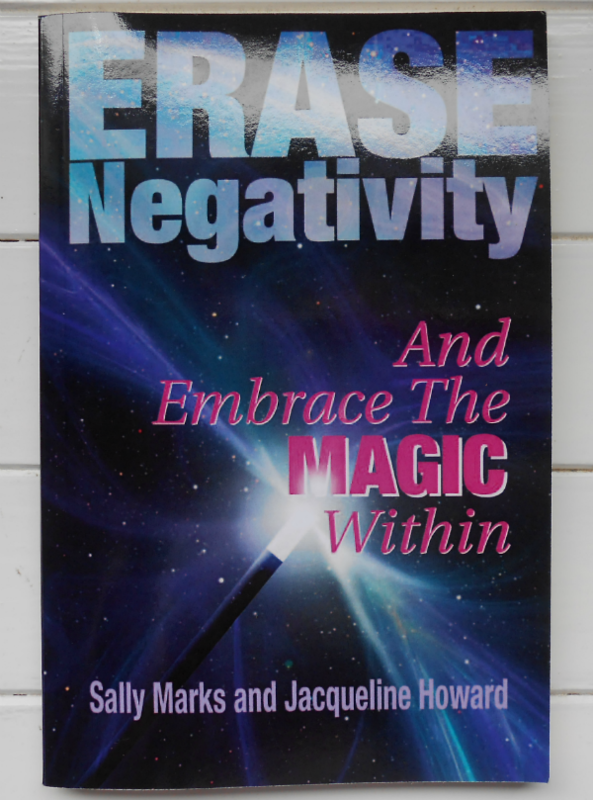 Post Disclaimer: I received ‘ERASE Negativity And Embrace The Magic Within’ from Sally Marks. Hi Karen, that totally happens to me too, I try to take deep breaths. Work- but I am making changes for the better. I find it hardest to have positivity regarding what I am capable of achieving. I find it hardest to make changes, even if I need too. I find it hard to keep a positive attitude about most things, there is so much pain and cruelty in the world it's just depressing. I find it hardest to keep a positive attitude when confronted with my weaknesses. I find it harder to keep a positive attitude about some ppl who have a bad and negative attitude themselves and treat me like dirt , this is spose to be family , and they say family is thicker then water… not true! as there is so many negative people around me! I find it hard not to let someone else's negativity bring me down into their negative world. Myself, my worth and the possibility of escaping the darkness. relationships and trust is the most difficult thing to keep positive about for me ! My mother and (all of) her issues. My self esteem!! The joys of PTSD! friendships and my life in general.